Some people say they are dolls but some people say they aren't. I believe trolls are dolls since they are jointed representations of human-like creatures meant for play. 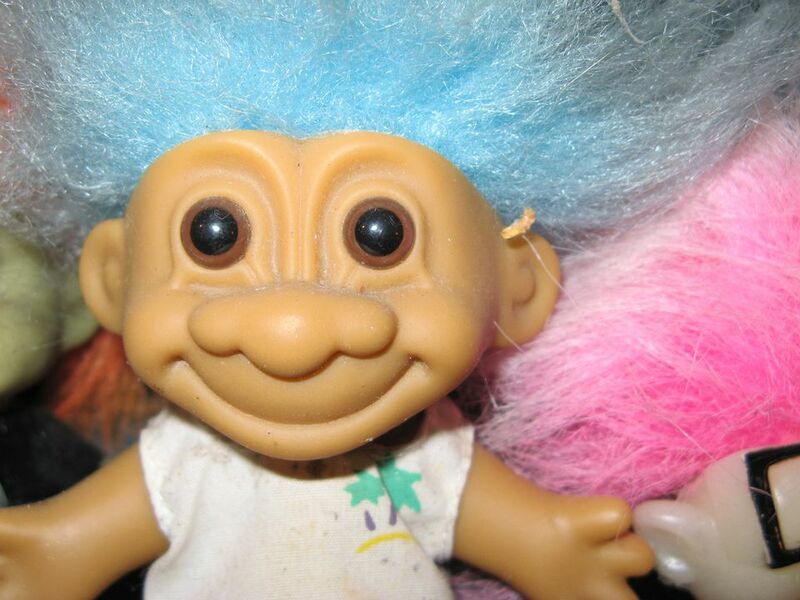 Dolls or not, Trolls are immensely popular with collectors and have been since their creation in the 1960s. These toys created a fad in the 60's, 70's and 90's. With the release of the new Trolls movie, their popularity is on the rise once again. Troll dolls come in a range of sizes. You can find very tiny trolls at only two or three inches tall, up to very large trolls at 18 inches or so. Any troll at 12 inches or so is considered very large, with trolls over that considered gigantic. Large vintage trolls are generally much rarer than small vintage trolls. The company Dam Things was started by Thomas Dam, a Danish man who invented the original trolls. Dam, a woodcutter, made the first troll for his daughter out of wood when he was too poor to buy her a toy. Other children in the town soon wanted one so Dam started a company to make them out of plastic. Dam had some trouble with his copyright which allowed many other companies to produced trolls and troll clones including Nyform, Reisler, Uneeda (Wishniks) and Playmates. Although troll production started in 1959, trolls became wildly popular in the 1960s, when they had their peak of popularity. Trolls have gone in and out of production ever since. Today they are produced as both playthings and as collectibles by such companies as Nyform and even Dam Things (only in Denmark). Nearly all trolls are made out of hard vinyl, although they have been made out of nearly every other material you can imagine including ceramics, rubber, porcelain and even hemp! Trolls generally have jointed arms and heads (although some have unjointed arms) and plastic or glass eyes, with a little sprout of hair on their heads. They have great big heads, hands, and feet. The prices on trolls range from only a few dollars for late, common Russ trolls, to over $200 dollars for rare 1960s Dam Things animal trolls (like giraffes and lions). Smaller, more common animals can be found for $25 to $50 dollars. Non-Dam troll animals can be much cheaper, especially if their tags are not attached. Small 1960s trolls can be found for prices ranging from $15-$30 dollars. Certain rare, vintage Nyform trolls from Norway can bring over $500 dollars as can rarer large over 12 inch Dam trolls from the 1960s. I wouldn't be surprised at this point if you are looking for a box in your garage that has your old trolls from your college or childhood! Remember, though, all trolls are not valuable today. They were produced in the hundreds of millions, and only mint and rare trolls bring high prices. A collection of trolls, however, can fit in nicely with either a collection of dolls or a collection of toys. In any event, just looking at a troll can bring a wave of nostalgia for the 1960s or 1970s, when trolls seemed to be taking over the universe! What to expect when selling a doll collection.